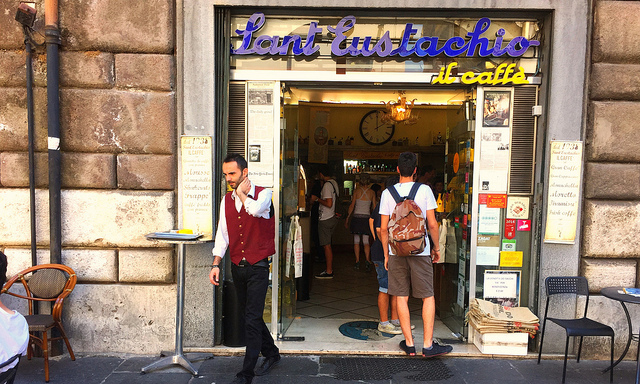 A few minutes walk from both the Pantheon and Piazza Navona is a true Italian coffee bar with a lot of history. Still including all of the decor from it’s opening in 1938, it’s the perfect place for a leisurely morning espresso across from the 1,000-year old Sant’Eustucio Basilica, or a quick afternoon espresso at the bar (reminder, prices increase for “service” at the six outside tables). Also look for every kind of coffee item imaginable, from beans to mugs to candies and coffee liquors, a perfect souvenir for a coffee-loving friend.